Pulmonary embolism (PE) is a blockage of an artery in the lungs by a substance that has moved from elsewhere in the body through the bloodstream (embolism). Symptoms of a PE may include shortness of breath, chest pain particularly upon breathing in, and coughing up blood. Symptoms of a blood clot in the leg may also be present, such as a red, warm, swollen, and painful leg. Signs of a PE include low blood oxygen levels, rapid breathing, rapid heart rate, and sometimes a mild fever. Severe cases can lead to passing out, abnormally low blood pressure, and sudden death. Chest spiral CT scan with radiocontrast agent showing multiple filling defects both at the bifurcation ("saddle" pulmonary embolism) and in the pulmonary arteries. PE usually results from a blood clot in the leg that travels to the lung. The risk of blood clots is increased by cancer, prolonged bed rest, smoking, stroke, certain genetic conditions, estrogen-based medication, pregnancy, obesity, and after some types of surgery. A small proportion of cases are due to the embolization of air, fat, or amniotic fluid. Diagnosis is based on signs and symptoms in combination with test results. If the risk is low, a blood test known as a D-dimer may rule out the condition. Otherwise, a CT pulmonary angiography, lung ventilation/perfusion scan, or ultrasound of the legs may confirm the diagnosis. Together, deep vein thrombosis and PE are known as venous thromboembolism (VTE). Efforts to prevent PE include beginning to move as soon as possible after surgery, lower leg exercises during periods of sitting, and the use of blood thinners after some types of surgery. Treatment is typically with blood thinners such as heparin or warfarin. Often these are recommended for at least six months. Severe cases may require thrombolysis using medication such as tissue plasminogen activator (tPA), or may require surgery, such as a pulmonary thrombectomy. If blood thinners are not appropriate, a vena cava filter may be used. Pulmonary emboli affect about 430,000 people each year in Europe. In the United States, between 300,000 and 600,000 cases occur each year, which results in between 50,000 and 200,000 deaths. Rates are similar in males and females. They become more common as people get older. Symptoms of pulmonary embolism are typically sudden in onset and may include one or many of the following: dyspnea (shortness of breath), tachypnea (rapid breathing), chest pain of a "pleuritic" nature (worsened by breathing), cough and hemoptysis (coughing up blood). More severe cases can include signs such as cyanosis (blue discoloration, usually of the lips and fingers), collapse, and circulatory instability because of decreased blood flow through the lungs and into the left side of the heart. About 15% of all cases of sudden death are attributable to PE. While PE may present with syncope, less than 1% of syncope cases are due to PE. On physical examination, the lungs are usually normal. Occasionally, a pleural friction rub may be audible over the affected area of the lung (mostly in PE with infarct). A pleural effusion is sometimes present that is exudative, detectable by decreased percussion note, audible breath sounds, and vocal resonance. Strain on the right ventricle may be detected as a left parasternal heave, a loud pulmonary component of the second heart sound, and/or raised jugular venous pressure. A low-grade fever may be present, particularly if there is associated pulmonary hemorrhage or infarction. As smaller pulmonary emboli tend to lodge in more peripheral areas without collateral circulation they are more likely to cause lung infarction and small effusions (both of which are painful), but not hypoxia, dyspnea or hemodynamic instability such as tachycardia. Larger PEs, which tend to lodge centrally, typically cause dyspnea, hypoxia, low blood pressure, fast heart rate and fainting, but are often painless because there is no lung infarction due to collateral circulation. The classic presentation for PE with pleuritic pain, dyspnea and tachycardia is likely caused by a large fragmented embolism causing both large and small PEs. Thus, small PEs are often missed because they cause pleuritic pain alone without any other findings and large PEs often missed because they are painless and mimic other conditions often causing ECG changes and small rises in troponin and BNP levels. PEs are sometimes described as massive, submassive and nonmassive depending on the clinical signs and symptoms. Although the exact definitions of these are unclear, an accepted definition of massive PE is one in which there is hemodynamic instability such as sustained low blood pressure, slowed heart rate, or pulselessness. About 90% of emboli are from proximal leg deep vein thromboses (DVTs) or pelvic vein thromboses. DVTs are at risk for dislodging and migrating to the lung circulation. The conditions are generally regarded as a continuum termed venous thromboembolism (VTE). The development of thrombosis is classically due to a group of causes named Virchow's triad (alterations in blood flow, factors in the vessel wall and factors affecting the properties of the blood). Often, more than one risk factor is present. After a first PE, the search for secondary causes is usually brief. Only when a second PE occurs, and especially when this happens while still under anticoagulant therapy, a further search for underlying conditions is undertaken. This will include testing ("thrombophilia screen") for Factor V Leiden mutation, antiphospholipid antibodies, protein C and S and antithrombin levels, and later prothrombin mutation, MTHFR mutation, Factor VIII concentration and rarer inherited coagulation abnormalities. In order to diagnose a pulmonary embolism, a review of clinical criteria to determine the need for testing is recommended. In those who have low risk, age less than 50, heart rate less than 100 beats per minute, oxygen level more than 94% on room air, and no leg swelling, coughing up of blood, surgery or trauma in the last four weeks, previous blood clots, or estrogen use, further testing is not typically needed. If there are concerns this is followed by testing to determine a likelihood of being able to confirm a diagnosis by imaging, followed by imaging if other tests have shown that there is a likelihood of a PE diagnosis. The diagnosis of PE is based primarily on validated clinical criteria combined with selective testing because the typical clinical presentation (shortness of breath, chest pain) cannot be definitively differentiated from other causes of chest pain and shortness of breath. The decision to perform medical imaging is based on clinical reasoning, that is, the medical history, symptoms and findings on physical examination, followed by an assessment of clinical probability. The most commonly used method to predict clinical probability, the Wells score, is a clinical prediction rule, whose use is complicated by multiple versions being available. In 1995, Philip Steven Wells, initially developed a prediction rule (based on a literature search) to predict the likelihood of PE, based on clinical criteria. The prediction rule was revised in 1998 This prediction rule was further revised when simplified during a validation by Wells et al. in 2000. In the 2000 publication, Wells proposed two different scoring systems using cutoffs of 2 or 4 with the same prediction rule. In 2001, Wells published results using the more conservative cutoff of 2 to create three categories. An additional version, the "modified extended version", using the more recent cutoff of 2 but including findings from Wells's initial studies were proposed. Most recently, a further study reverted to Wells's earlier use of a cutoff of 4 points to create only two categories. There are additional prediction rules for PE, such as the Geneva rule. More importantly, the use of any rule is associated with reduction in recurrent thromboembolism. Low clinical probability. If negative D-dimer, PE is excluded. If positive D-dimer, obtain MDCT and based treatment on results. Moderate clinical probability. If negative D-dimer, PE is excluded. However, the authors were not concerned that a negative MDCT with negative D-dimer in this setting has a 5% probability of being false. Presumably, the 5% error rate will fall as 64 slice MDCT is more commonly used. If positive D-dimer, obtain MDCT and based treatment on results. High clinical probability. Proceed to MDCT. If positive, treat, if negative, more tests are needed to exclude PE. A D-dimer of less than 750 ug/L does not rule out PE in those who are at high risk. The pulmonary embolism rule-out criteria (PERC) helps assess people in whom pulmonary embolism is suspected, but unlikely. Unlike the Wells score and Geneva score, which are clinical prediction rules intended to risk stratify people with suspected PE, the PERC rule is designed to rule out risk of PE in people when the physician has already stratified them into a low-risk category. People in this low risk category without any of these criteria may undergo no further testing for PE: low oxygen saturations — SaO2 <95%, unilateral leg swelling, coughing up blood, prior DVT or PE, recent surgery or trauma, age >50, hormone use, fast heart rate. The rationale behind this decision is that further testing (specifically CT angiogram of the chest) may cause more harm (from radiation exposure and contrast dye) than the risk of PE. The PERC rule has a sensitivity of 97.4% and specificity of 21.9% with a false negative rate of 1.0% (16/1666). In people with a low or moderate suspicion of PE, a normal D-dimer level (shown in a blood test) is enough to exclude the possibility of thrombotic PE, with a three-month risk of thromboembolic events being 0.14%. D-dimer is highly sensitive but not specific (specificity around 50%). In other words, a positive D-dimer is not synonymous with PE, but a negative D-dimer is, with a good degree of certainty, an indication of absence of a PE. The typical cut off is 500 μg/L, although this varies based on the assay. However, in those over the age of 50, changing the cut-off value to the person's age multiplied by 10 μg/L (accounting for assay which has been used) is recommended as it decreases the number of falsely positive tests without missing any additional cases of PE. When a PE is being suspected, several blood tests are done in order to exclude important secondary causes of PE. This includes a full blood count, clotting status (PT, aPTT, TT), and some screening tests (erythrocyte sedimentation rate, renal function, liver enzymes, electrolytes). If one of these is abnormal, further investigations might be warranted to the issue. Troponin levels are increased in between 16–47% with pulmonary embolism. In typical people who are not known to be at high risk of PE, imaging is helpful to confirm or exclude a diagnosis of PE after simpler first-line tests are used. Medical societies recommend tests such as the D-dimer to first provide supporting evidence for the need for imaging, and imaging would be done if other tests confirmed a moderate or high probability of finding evidence to support a diagnosis of PE. CT pulmonary angiography is the recommended first line diagnostic imaging test in most people. Ultrasound of the legs can confirm the presence of a PE but cannot rule it out. 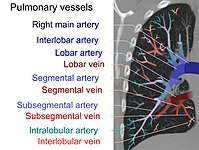 CT pulmonary angiography (CTPA) is a pulmonary angiogram obtained using computed tomography (CT) with radiocontrast rather than right heart catheterization. Its advantages are clinical equivalence, its non-invasive nature, its greater availability to people, and the possibility of identifying other lung disorders from the differential diagnosis in case there is no pulmonary embolism. On CT scan, pulmonary emboli can be classified according to level along the arterial tree. CT pulmonary angiography showing a "saddle embolus" at the bifurcation of the main pulmonary artery and thrombus burden in the lobar arteries on both sides. Pulmonary embolism (white arrow) that have been long-standing and has caused a lung infarction (black arrow) seen as a reverse halo sign. Assessing the accuracy of CT pulmonary angiography is hindered by the rapid changes in the number of rows of detectors available in multidetector CT (MDCT) machines. According to a cohort study, single-slice spiral CT may help diagnose detection among people with suspected pulmonary embolism. In this study, the sensitivity was 69% and specificity was 84%. In this study which had a prevalence of detection was 32%, the positive predictive value of 67.0% and negative predictive value of 85.2%. However, this study's results may be biased due to possible incorporation bias, since the CT scan was the final diagnostic tool in people with pulmonary embolism. The authors noted that a negative single slice CT scan is insufficient to rule out pulmonary embolism on its own. A separate study with a mixture of 4 slice and 16 slice scanners reported a sensitivity of 83% and a specificity of 96%, which means that it is a good test for ruling out a pulmonary embolism if it is not seen on imaging and that it is very good at confirming a pulmonary embolism is present if it is seen. This study noted that additional testing is necessary when the clinical probability is inconsistent with the imaging results. CTPA is non-inferior to VQ scanning, and identifies more emboli (without necessarily improving the outcome) compared to VQ scanning. (A) After inhalation of 20 mCi of Xenon-133 gas, scintigraphic images were obtained in the posterior projection, showing uniform ventilation to lungs. (B) After intravenous injection of 4 mCi of Technetium-99m-labeled albumin, scintigraphic images shown here in the posterior projection. This and other views showed decreased activity in multiple regions. A ventilation/perfusion scan (or V/Q scan or lung scintigraphy) shows that some areas of the lung are being ventilated but not perfused with blood (due to obstruction by a clot). This type of examination is as accurate as multislice CT, but is less used, due to the greater availability of CT technology. It is particularly useful in people who have an allergy to iodinated contrast, impaired renal function, or are pregnant (due to its lower radiation exposure as compared to CT). The test can be performed with planar two-dimensional imaging, or single photon emission tomography (SPECT) which enables three-dimensional imaging. Hybrid devices combining SPECT and CT (SPECT/CT) further enable anatomic characterization of any abnormality. Tests that are frequently done that are not sensitive for PE, but can be diagnostic. Chest X-rays are often done on people with shortness of breath to help rule-out other causes, such as congestive heart failure and rib fracture. Chest X-rays in PE are rarely normal, but usually lack signs that suggest the diagnosis of PE (for example, Westermark sign, Hampton's hump). Ultrasonography of the legs, also known as leg doppler, in search of deep venous thrombosis (DVT). 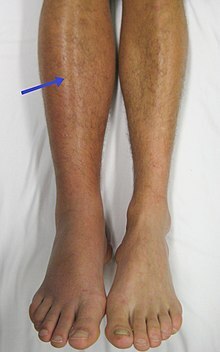 The presence of DVT, as shown on ultrasonography of the legs, is in itself enough to warrant anticoagulation, without requiring the V/Q or spiral CT scans (because of the strong association between DVT and PE). This may be a valid approach in pregnancy, in which the other modalities would increase the risk of birth defects in the unborn child. However, a negative scan does not rule out PE, and low-radiation dose scanning may be required if the mother is deemed at high risk of having a pulmonary embolism. The main use of ultrasonography of the legs is therefore in those with clinical symptoms suggestive of a deep vein thrombosis. Selective pulmonary angiogram revealing clot (labeled A) causing a central obstruction in the left main pulmonary artery. ECG tracing shown at bottom. Historically, the gold standard for diagnosis was pulmonary angiography by fluoroscopy, but this has fallen into disuse with the increased availability of non-invasive techniques that offer similar diagnostic accuracy. Electrocardiogram of a person with pulmonary embolism, showing sinus tachycardia of approximately 100 beats per minute, large S wave in Lead I, moderate Q wave in Lead III, inverted T wave in Lead III, and inverted T waves in leads V1 and V3. The primary use of the ECG is to rule out other causes of chest pain. An electrocardiogram (ECG) is routinely done on people with chest pain to quickly diagnose myocardial infarctions (heart attacks), an important differential diagnosis in an individual with chest pain. While certain ECG changes may occur with PE, none are specific enough to confirm or sensitive enough to rule out the diagnosis. An ECG may show signs of right heart strain or acute cor pulmonale in cases of large PEs — the classic signs are a large S wave in lead I, a large Q wave in lead III, and an inverted T wave in lead III (S1Q3T3), which occurs in 12–50% of people with the diagnosis, yet also occurs in 12% without the diagnosis. This is occasionally present (occurring in up to 20% of people), but may also occur in other acute lung conditions, and, therefore, has limited diagnostic value. The most commonly seen signs in the ECG are sinus tachycardia, right axis deviation, and right bundle branch block. Sinus tachycardia, however, is still only found in 8–69% of people with PE. ECG findings associated with pulmonary emboli may suggest worse prognosis since the six findings identified with RV strain on ECG (heart rate > 100 beats per minute, S1Q3T3, inverted T waves in leads V1-V4, ST elevation in aVR, complete right bundle branch block, and atrial fibrillation) are associated with increased risk of circulatory shock and death. Cases with inverted T in leads V1-3 are suspected with PE or inferior myocardial infarction. PE cases show inverted T waves in leads II and aVF, but inferior myocardial infarction cases do not show inverted T waves in II and aVF. In massive and submassive PE, dysfunction of the right side of the heart may be seen on echocardiography, an indication that the pulmonary artery is severely obstructed and the right ventricle, a low-pressure pump, is unable to match the pressure. Some studies (see below) suggest that this finding may be an indication for thrombolysis. Not every person with a (suspected) pulmonary embolism requires an echocardiogram, but elevations in cardiac troponins or brain natriuretic peptide may indicate heart strain and warrant an echocardiogram, and be important in prognosis. The specific appearance of the right ventricle on echocardiography is referred to as the McConnell's sign. This is the finding of akinesia of the mid-free wall but a normal motion of the apex. This phenomenon has a 77% sensitivity and a 94% specificity for the diagnosis of acute pulmonary embolism in the setting of right ventricular dysfunction. Pulmonary embolism may be preventable in those with risk factors. People admitted to hospital may receive preventative medication, including unfractionated heparin, low molecular weight heparin (LMWH), or fondaparinux, and anti-thrombosis stockings to reduce the risk of a DVT in the leg that could dislodge and migrate to the lungs. Following the completion of warfarin in those with prior PE, long-term aspirin is useful to prevent recurrence. Anticoagulant therapy is the mainstay of treatment. Acutely, supportive treatments, such as oxygen or analgesia, may be required. People are often admitted to hospital in the early stages of treatment, and tend to remain under inpatient care until the INR has reached therapeutic levels. Increasingly, however, low-risk cases are managed at home in a fashion already common in the treatment of DVT. Evidence to support one approach versus the other is weak. Usually, anticoagulant therapy is the mainstay of treatment. Unfractionated heparin (UFH), low molecular weight heparin (LMWH), or fondaparinux is administered initially, while warfarin, acenocoumarol, or phenprocoumon therapy is commenced (this may take several days, usually while the patient is in the hospital). LMWH may reduce bleeding among people with pulmonary embolism as compared to UFH according to a systematic review of randomized controlled trials by the Cochrane Collaboration. According to the same review, LMWH reduced the incidence of recurrent thrombotic complications and reduced thrombus size when compared to heparin. There was no difference in overall mortality between participants treated with LMWH and those treated with unfractionated heparin. Warfarin therapy often requires a frequent dose adjustment and monitoring of the international normalized ratio (INR). In PE, INRs between 2.0 and 3.0 are generally considered ideal. If another episode of PE occurs under warfarin treatment, the INR window may be increased to e.g. 2.5–3.5 (unless there are contraindications) or anticoagulation may be changed to a different anticoagulant e.g. LMWH. In patients with an underlying malignancy, therapy with a course of LMWH is favored over warfarin; it is continued for six months, at which point a decision should be reached whether ongoing treatment is required. Similarly, pregnant women are often maintained on low molecular weight heparin until at least six weeks after delivery to avoid the known teratogenic effects of warfarin, especially in the early stages of pregnancy. Warfarin therapy is usually continued for 3–6 months, or "lifelong" if there have been previous DVTs or PEs, or none of the usual risk factors is present. An abnormal D-dimer level at the end of treatment might signal the need for continued treatment among patients with a first unprovoked pulmonary embolus. For those with small PEs (known as subsegmental PEs) the effects of anticoagulation is unknown as it has not been properly studied as of 2014. Massive PE causing hemodynamic instability (shock and/or low blood pressure, defined as a systolic blood pressure <90 mmHg or a pressure drop of 40 mmHg for >15 min if not caused by new-onset arrhythmia, hypovolemia or sepsis) is an indication for thrombolysis, the enzymatic destruction of the clot with medication. In this situation, it is the best available treatment in those without contraindications and is supported by clinical guidelines. It is also recommended in those in cardiac arrest with a known PE. Catheter-directed thrombolysis (CDT) is a new technique found to be relatively safe and effective for massive PEs. This involves accessing the venous system by placing a catheter into a vein in the groin and guiding it through the veins by using fluoroscopic imaging until it is located next to the PE in the lung circulation. Medication that breaks up blood clots is released through the catheter so that its highest concentration is directly next to the pulmonary embolus. CDT is performed by interventional radiologists or vascular surgeons, and in medical centers that offer CDT, it may be offered as a first-line treatment. Catheter-based ultrasound-assisted thrombolysis is being investigated. The use of thrombolysis in non-massive PEs is still debated. [needs update] Some have found that the treatment decreases the risk of death and increases the risk of bleeding including intracranial hemorrhage. Others have found no decrease in the risk of death. Used inferior vena cava filter. There are two situations when an inferior vena cava filter is considered advantageous, and those are if anticoagulant therapy is contraindicated (e.g. shortly after a major operation), or a person has a pulmonary embolus in spite of being anticoagulated. In these instances, it may be implanted to prevent new or existing DVTs from entering the pulmonary artery and combining with an existing blockage. In spite of the device's theoretical advantage of preventing pulmonary emboli, there is a lack of evidence supporting its effectiveness. Inferior vena cava filters should be removed as soon as it becomes safe to start using anticoagulation. Although modern filters are meant to be retrievable, complications may prevent some from being removed. The long-term safety profile of permanently leaving a filter inside the body is not known. Surgical management of acute pulmonary embolism (pulmonary thrombectomy) is uncommon and has largely been abandoned because of poor long-term outcomes. However, recently, it has gone through a resurgence with the revision of the surgical technique and is thought to benefit certain people. Chronic pulmonary embolism leading to pulmonary hypertension (known as chronic thromboembolic hypertension) is treated with a surgical procedure known as a pulmonary thromboendarterectomy. Pulmonary emboli occur in more than 600,000 people in the United States each year. It results in between 50,000 and 200,000 deaths per year in the United States. The risk in those who are hospitalized is around 1%. The rate of fatal pulmonary emboli has declined from 6% to 2% over the last 25 years in the United States. Large saddle embolus seen in the pulmonary artery (white arrows). Less than 5 to 10% of symptomatic PEs are fatal within the first hour of symptoms. There are several markers used for risk stratification and these are also independent predictors of adverse outcome. These include hypotension, cardiogenic shock, syncope, evidence of right heart dysfunction, and elevated cardiac enzymes. Some ECG changes including S1Q3T3 also correlate with worse short-term prognosis. There have been other patient-related factors such as COPD and chronic heart failure thought to also play a role in prognosis. Prognosis depends on the amount of lung that is affected and on the co-existence of other medical conditions; chronic embolisation to the lung can lead to pulmonary hypertension. After a massive PE, the embolus must be resolved somehow if the patient is to survive. In thrombotic PE, the blood clot may be broken down by fibrinolysis, or it may be organized and recanalized so that a new channel forms through the clot. Blood flow is restored most rapidly in the first day or two after a PE. Improvement slows thereafter and some deficits may be permanent. There is controversy over whether small subsegmental PEs need treatment at all and some evidence exists that patients with subsegmental PEs may do well without treatment. Once anticoagulation is stopped, the risk of a fatal pulmonary embolism is 0.5% per year. Mortality from untreated PEs was said to be 26%. This figure comes from a trial published in 1960 by Barrit and Jordan, which compared anticoagulation against placebo for the management of PE. Barritt and Jordan performed their study in the Bristol Royal Infirmary in 1957. This study is the only placebo controlled trial ever to examine the place of anticoagulants in the treatment of PE, the results of which were so convincing that the trial has never been repeated as to do so would be considered unethical. That said, the reported mortality rate of 26% in the placebo group is probably an overstatement, given that the technology of the day may have detected only severe PEs. The PESI and sPESI scoring tools can estimate mortality of patients. The Geneva prediction rules and Wells criteria are used to calculate a pre-test probability of patients to predict who has a pulmonary embolism. These scores are tools to be used with clinical judgment in deciding diagnostic testing and types of therapy. The PESI algorithm comprises 11 routinely available clinical variables. It puts the subjects into one of five classes (I-V), with 30-day mortality ranging from 1.1% to 24.5%. Those in classes I and II are low-risk and those in classes III-V are high-risk. ^ a b c "What Are the Signs and Symptoms of Pulmonary Embolism?". NHLBI. July 1, 2011. Archived from the original on 9 March 2016. Retrieved 12 March 2016. ^ a b c d e Goldhaber SZ (2005). "Pulmonary thromboembolism". In Kasper DL, Braunwald E, Fauci AS, et al. (eds.). Harrison's Principles of Internal Medicine (16th ed.). New York, NY: McGraw-Hill. pp. 1561–65. ISBN 978-0-07-139140-5. ^ a b c d e "Who Is at Risk for Pulmonary Embolism?". NHLBI. July 1, 2011. Archived from the original on 15 February 2016. Retrieved 12 March 2016. ^ a b c d "How Is Pulmonary Embolism Diagnosed?". NHLBI. July 1, 2011. Archived from the original on 7 April 2016. Retrieved 12 March 2016. ^ a b c d "How Is Pulmonary Embolism Treated?". NHLBI. July 1, 2011. Archived from the original on 9 March 2016. Retrieved 12 March 2016. ^ a b c d "What Is Pulmonary Embolism?". NHLBI. July 1, 2011. Archived from the original on 12 March 2016. Retrieved 12 March 2016. ^ a b c d e f Rahimtoola A, Bergin JD (February 2005). "Acute pulmonary embolism: an update on diagnosis and management". Current Problems in Cardiology. 30 (2): 61–114. doi:10.1016/j.cpcardiol.2004.06.001. PMID 15650680. ^ a b Raskob, GE; Angchaisuksiri, P; Blanco, AN; Buller, H; Gallus, A; Hunt, BJ; Hylek, EM; Kakkar, A; Konstantinides, SV; McCumber, M; Ozaki, Y; Wendelboe, A; Weitz, JI; ISTH Steering Committee for World Thrombosis, Day (November 2014). "Thrombosis: a major contributor to global disease burden". Arteriosclerosis, Thrombosis, and Vascular Biology. 34 (11): 2363–71. doi:10.1161/atvbaha.114.304488. PMID 25304324. ^ a b c d Kumar V, Abbas AK, Fausto N, Mitchell RN (2010). Basic Pathology. New Delhi: Elsevier. p. 98. ISBN 978-81-312-1036-9. ^ Tintinalli, Judith E. (2010). Emergency Medicine: A Comprehensive Study Guide (Emergency Medicine (Tintinalli)) (7 ed.). New York: McGraw-Hill Companies. p. 432. ISBN 978-0-07-148480-0. ^ "What Causes Pulmonary Embolism?". NHLBI. July 1, 2011. Archived from the original on 7 April 2016. Retrieved 12 March 2016. ^ Pantaleo, G; Luigi, N; Federica, T; Paola, S; Margherita, N; Tahir, M (2014). "Amniotic fluid embolism: review". Current Pharmaceutical Biotechnology. 14 (14): 1163–7. doi:10.2174/1389201015666140430161404. PMID 24804726. ^ "Other Names for Pulmonary Embolism". July 1, 2011. Archived from the original on 16 March 2016. Retrieved 12 March 2016. ^ "How Can Pulmonary Embolism Be Prevented?". NHLBI. July 1, 2011. Archived from the original on 7 April 2016. Retrieved 12 March 2016. ^ "Living With Pulmonary Embolism". July 1, 2011. Archived from the original on 7 April 2016. Retrieved 12 March 2016. ^ a b Lewis, S; Dirksen, S; Heitkemper, M; Bucher, L (2014). Medical-surgical nursing: Assessment and management of clinical problems (9 ed.). St. Louis, MO: Elsevier Mosby. p. 552. ISBN 978-0-323-08678-3. ^ Oqab, Z; Ganshorn, H; Sheldon, R (April 2018). "Prevalence of pulmonary embolism in patients presenting with syncope. A systematic review and meta-analysis". The American Journal of Emergency Medicine. 36 (4): 551–555. doi:10.1016/j.ajem.2017.09.015. PMID 28947223. ^ Stein PD, Sostman HD, Hull RD, Goodman LR, Leeper KV, Gottschalk A, Tapson VF, Woodard PK (March 2009). "Diagnosis of Pulmonary Embolism in the Coronary Care Unit". Am. J. Cardiol. 103 (6): 881–6. doi:10.1016/j.amjcard.2008.11.040. PMC 2717714. PMID 19268750. ^ a b Jaff MR, McMurtry MS, Archer SL, Cushman M, Goldenberg N, Goldhaber SZ, Jenkins JS, Kline JA, Michaels AD, Thistlethwaite P, Vedantham S, White RJ, Zierler BK (Apr 26, 2011). American Heart Association Council on Cardiopulmonary, Critical Care, Perioperative and Resuscitation, American Heart Association Council on Peripheral Vascular Disease, American Heart Association Council on Arteriosclerosis, Thrombosis, and Vascular Biology. "Management of massive and submassive pulmonary embolism, iliofemoral deep vein thrombosis, and chronic thromboembolic pulmonary hypertension: a scientific statement from the American Heart Association". Circulation. 123 (16): 1788–830. doi:10.1161/CIR.0b013e318214914f. PMID 21422387. ^ Ferri, F (2012). Ferri's Clinical Advisor. St. Louis: Mosby's. ^ "Pulmonary embolus". MedlinePlus Medical Encyclopedia. Archived from the original on 25 April 2017. Retrieved 24 April 2017. ^ a b c American College of Radiology. "Five Things Physicians and Patients Should Question" (PDF). Choosing Wisely: an initiative of the ABIM Foundation. American College of Radiology. Archived (PDF) from the original on April 16, 2012. Retrieved August 17, 2012. ^ a b Raja, AS; Greenberg, JO; Qaseem, A; Denberg, TD; Fitterman, N; Schuur, JD (29 September 2015). "Evaluation of Patients With Suspected Acute Pulmonary Embolism: Best Practice Advice From the Clinical Guidelines Committee of the American College of Physicians". Annals of Internal Medicine. 163 (9): 701–11. doi:10.7326/M14-1772. PMID 26414967. ^ a b c Stein PD, Woodard PK, Weg JG, Wakefield TW, Tapson VF, Sostman HD, Sos TA, Quinn DA, Leeper KV, Hull RD, Hales CA, Gottschalk A, Goodman LR, Fowler SE, Buckley JD (2007). "Diagnostic Pathways in Acute Pulmonary Embolism: Recommendations of the PIOPED II Investigators". Radiology. 242 (1): 15–21. doi:10.1148/radiol.2421060971. PMID 17185658. ^ a b c d e Authors/Task Force, Members; Konstantinides, SV; Torbicki, A; Agnelli, G; Danchin, N; Fitzmaurice, D; Galiè, N; Gibbs, JS; Huisman, MV; Humbert, M; Kucher, N; Lang, I; Lankeit, M; Lekakis, J; Maack, C; Mayer, E; Meneveau, N; Perrier, A; Pruszczyk, P; Rasmussen, LH; Schindler, TH; Svitil, P; Vonk Noordegraaf, A; Zamorano, JL; Zompatori, M; Authors/Task Force, Members (Aug 29, 2014). "2014 ESC Guidelines on the diagnosis and management of acute pulmonary embolism: The Task Force for the Diagnosis and Management of Acute Pulmonary Embolism of the European Society of Cardiology (ESC) Endorsed by the European Respiratory Society (ERS)". European Heart Journal. 35 (43): 3033–3073. doi:10.1093/eurheartj/ehu283. PMID 25173341. ^ a b Wells PS, Hirsh J, Anderson DR, Lensing AW, Foster G, Kearon C, Weitz J, D'Ovidio R, Cogo A, Prandoni P (1995). "Accuracy of clinical assessment of deep-vein thrombosis". Lancet. 345 (8961): 1326–30. doi:10.1016/S0140-6736(95)92535-X. PMID 7752753. ^ a b Wells PS, Ginsberg JS, Anderson DR, Kearon C, Gent M, Turpie AG, Bormanis J, Weitz J, Chamberlain M, Bowie D, Barnes D, Hirsh J (1998). "Use of a clinical model for safe management of patients with suspected pulmonary embolism". Ann Intern Med. 129 (12): 997–1005. doi:10.7326/0003-4819-129-12-199812150-00002. PMID 9867786. ^ a b c d e Wells PS, Anderson DR, Rodger M, Ginsberg JS, Kearon C, Gent M, Turpie AG, Bormanis J, Weitz J, Chamberlain M, Bowie D, Barnes D, Hirsh J (2000). "Derivation of a simple clinical model to categorize patients probability of pulmonary embolism: increasing the models utility with the SimpliRED D-dimer". Thromb Haemost. 83 (3): 416–20. doi:10.1055/s-0037-1613830. PMID 10744147. ^ a b Wells PS, Anderson DR, Rodger M, Stiell I, Dreyer JF, Barnes D, Forgie M, Kovacs G, Ward J, Kovacs MJ (2001). "Excluding pulmonary embolism at the bedside without diagnostic imaging: management of patients with suspected pulmonary embolism presenting to the emergency department by using a simple clinical model and d-dimer". Ann Intern Med. 135 (2): 98–107. doi:10.7326/0003-4819-135-2-200107170-00010. PMID 11453709. ^ Sanson BJ, Lijmer JG, Mac Gillavry MR, Turkstra F, Prins MH, Büller HR (2000). "Comparison of a clinical probability estimate and two clinical models in patients with suspected pulmonary embolism. ANTELOPE-Study Group". Thromb. Haemost. 83 (2): 199–203. doi:10.1055/s-0037-1613785. PMID 10739372. ^ a b van Belle A, Büller HR, Huisman MV, Huisman PM, Kaasjager K, Kamphuisen PW, Kramer MH, Kruip MJ, Kwakkel-van Erp JM, Leebeek FW, Nijkeuter M, Prins MH, Sohne M, Tick LW (2006). "Effectiveness of managing suspected pulmonary embolism using an algorithm combining clinical probability, D-dimer testing, and computed tomography". JAMA. 295 (2): 172–9. doi:10.1001/jama.295.2.172. PMID 16403929. ^ Roy PM, Meyer G, Vielle B, Le Gall C, Verschuren F, Carpentier F, Leveau P, Furber A (2006). "Appropriateness of diagnostic management and outcomes of suspected pulmonary embolism". Ann. Intern. Med. 144 (3): 157–64. CiteSeerX 10.1.1.1032.7193. doi:10.7326/0003-4819-144-3-200602070-00003. PMID 16461959. ^ Neff MJ (2003). "ACEP releases clinical policy on evaluation and management of pulmonary embolism". American Family Physician. 68 (4): 759–60. PMID 12952389. Archived from the original on 2007-09-26. ^ Yap KS, Kalff V, Turlakow A, Kelly MJ (2007). "A prospective reassessment of the utility of the Wells score in identifying pulmonary embolism". Med. J. Aust. 187 (6): 333–6. PMID 17874979. ^ a b c d Stein PD, Woodard PK, Weg JG, Wakefield TW, Tapson VF, Sostman HD, Sos TA, Quinn DA, Leeper KV, Hull RD, Hales CA, Gottschalk A, Goodman LR, Fowler SE, Buckley JD (2007). "Diagnostic pathways in acute pulmonary embolism: recommendations of the PIOPED II Investigators". Radiology. 242 (1): 15–21. doi:10.1148/radiol.2421060971. PMID 17185658. ^ van Es, N; van der Hulle, T; Büller, HR; Klok, FA; Huisman, MV; Galipienzo, J; Di Nisio, M (22 November 2016). "Is stand-alone D-dimer testing safe to rule out acute pulmonary embolism?". Journal of Thrombosis and Haemostasis. 15 (2): 323–328. doi:10.1111/jth.13574. PMID 27873439. ^ Kline JA, Mitchell AM, Kabrhel C, Richman PB, Courtney DM (2004). "Clinical criteria to prevent unnecessary diagnostic testing in emergency department patients with suspected pulmonary embolism". Journal of Thrombosis and Haemostasis. 2 (8): 1247–55. doi:10.1111/j.1538-7836.2004.00790.x. PMID 15304025. ^ Kline JA, Courtney DM, Kabrhel C, Moore CL, Smithline HA, Plewa MC, Richman PB, O'Neil BJ, Nordenholz K (2008). "Prospective multicenter evaluation of the pulmonary embolism rule-out criteria". Journal of Thrombosis and Haemostasis. 6 (5): 772–780. doi:10.1111/j.1538-7836.2008.02944.x. PMID 18318689. Archived from the original on 2011-06-07. ^ Carrier M, Righini M, Djurabi RK, Huisman MV, Perrier A, Wells PS, Rodger M, Wuillemin WA, Le Gal G (May 2009). "VIDAS D-dimer in combination with clinical pre-test probability to rule out pulmonary embolism. A systematic review of management outcome studies". Thromb. Haemost. 101 (5): 886–92. doi:10.1160/TH-08-10-0689. PMID 19404542. ^ Schrecengost JE, LeGallo RD, Boyd JC, Moons KG, Gonias SL, Rose CE, Bruns DE (September 2003). "Comparison of diagnostic accuracies in outpatients and hospitalized patients of D-dimer testing for the evaluation of suspected pulmonary embolism". Clin. Chem. 49 (9): 1483–90. doi:10.1373/49.9.1483. PMID 12928229. ^ a b Schouten HJ, Geersing GJ, Koek HL, Zuithoff NP, Janssen KJ, Douma RA, van Delden JJ, Moons KG, Reitsma JB (May 3, 2013). "Diagnostic accuracy of conventional or age adjusted D-dimer cut-off values in older patients with suspected venous thromboembolism: systematic review and meta-analysis". BMJ (Clinical Research Ed.). 346: f2492. doi:10.1136/bmj.f2492. PMC 3643284. PMID 23645857. ^ van Es, N; van der Hulle, T; van Es, J; den Exter, PL; Douma, RA; Goekoop, RJ; Mos, IC; Galipienzo, J; Kamphuisen, PW; Huisman, MV; Klok, FA; Büller, HR; Bossuyt, PM (16 August 2016). "Wells Rule and d-Dimer Testing to Rule Out Pulmonary Embolism: A Systematic Review and Individual-Patient Data Meta-analysis". Annals of Internal Medicine. 165 (4): 253–61. doi:10.7326/m16-0031. PMID 27182696. ^ Werman, Howard A.; Karren, K; Mistovich, Joseph (2014). "Other Conditions That Cause Respiratory Distress: Pulmonary Embolism". In Werman A. Howard; Mistovich J; Karren K (eds.). Prehospital Emergency Care, 10e. Pearson Education, Inc. p. 456. ^ Söhne, Maaike; Ten Wolde, Marije; Büller, Harry R. (1 November 2004). "Biomarkers in pulmonary embolism". Current Opinion in Cardiology. 19 (6): 558–562. doi:10.1097/01.hco.0000138991.82347.0e. ISSN 0268-4705. PMID 15502498. ^ a b Torbicki A, Perrier A, Konstantinides S, Agnelli G, Galiè N, Pruszczyk P, Bengel F, Brady AJ, Ferreira D, Janssens U, Klepetko W, Mayer E, Remy-Jardin M, Bassand JP (2008). "Guidelines on the diagnosis and management of acute pulmonary embolism: The Task Force for the Diagnosis and Management of Acute Pulmonary Embolism of the European Society of Cardiology (ESC)". European Heart Journal. 29 (18): 2276–2315. doi:10.1093/eurheartj/ehn310. PMID 18757870. ^ a b Stein PD, Freeman LM, Sostman HD, Goodman LR, Woodard PK, Naidich DP, Gottschalk A, Bailey DL, Matta F, Yaekoub AY, Hales CA, Hull RD, Leeper KV, Tapson VF, Weg JG (2009). "SPECT in acute pulmonary embolism". J Nucl Med (Review). 50 (12): 1999–2007. doi:10.2967/jnumed.109.063958. PMID 19949025. ^ Da Costa Rodrigues, J; Alzuphar, S; Combescure, C; Le Gal, G; Perrier, A (5 July 2016). "Diagnostic characteristics of lower limb venous compression ultrasonography in suspected pulmonary embolism: a meta-analysis". Journal of Thrombosis and Haemostasis. 14 (9): 1765–72. doi:10.1111/jth.13407. PMID 27377039. ^ Schaefer-Prokop C, Prokop M (2005). "MDCT for the diagnosis of acute pulmonary embolism". European Radiology. 15 (Suppl 4): D37–41. doi:10.1007/s10406-005-0144-3. PMID 16479644. ^ Van Strijen MJ, De Monye W, Kieft GJ, Pattynama PM, Prins MH, Huisman MV (2005). "Accuracy of single-detector spiral CT in the diagnosis of pulmonary embolism: a prospective multicenter cohort study of consecutive patients with abnormal perfusion scintigraphy". Journal of Thrombosis and Haemostasis. 3 (1): 17–25. doi:10.1111/j.1538-7836.2004.01064.x. PMID 15634261. ^ a b Stein PD, Fowler SE, Goodman LR, Gottschalk A, Hales CA, Hull RD, Leeper KV, Popovich J, Quinn DA, Sos TA, Sostman HD, Tapson VF, Wakefield TW, Weg JG, Woodard PK (2006). "Multidetector computed tomography for acute pulmonary embolism". N. Engl. J. Med. 354 (22): 2317–27. doi:10.1056/NEJMoa052367. PMID 16738268. ^ Anderson DR, Kahn SR, Rodger MA, Kovacs MJ, Morris T, Hirsch A, Lang E, Stiell I, Kovacs G, Dreyer J, Dennie C, Cartier Y, Barnes D, Burton E, Pleasance S, Skedgel C, O'Rouke K, Wells PS (2007). "Computed tomographic pulmonary angiography vs ventilation-perfusion lung scanning in patients with suspected pulmonary embolism". JAMA. 298 (23): 2743–53. doi:10.1001/jama.298.23.2743. PMID 18165667. ^ Scarsbrook AF, Gleeson FV (2007). "Investigating suspected pulmonary embolism in pregnancy". BMJ. 334 (7590): 418–9. doi:10.1136/bmj.39071.617257.80. PMC 1804186. PMID 17322258. Archived from the original on 2007-09-04. ^ Leung AN, Bull TM, Jaeschke R, Lockwood CJ, Boiselle PM, Hurwitz LM, James AH, McCullough LB, Menda Y, Paidas MJ, Royal HD, Tapson VF, Winer-Muram HT, Chervenak FA, Cody DD, McNitt-Gray MF, Stave CD, Tuttle BD (2011-11-15). "An official American Thoracic Society/Society of Thoracic Radiology clinical practice guideline: evaluation of suspected pulmonary embolism in pregnancy". American Journal of Respiratory and Critical Care Medicine. 184 (10): 1200–8. doi:10.1164/rccm.201108-1575ST. PMID 22086989. ^ a b c Thomson, AJ; Greer, IA (April 2015). "Thrombosis and Embolism during Pregnancy and the Puerperium, the Acute Management of (Green-top Guideline No. 37b)". Royal College of Obstetricians & Gynaecologists. Retrieved 4 June 2018. ^ Worsley DF, Alavi A, Aronchick JM, Chen JT, Greenspan RH, Ravin CE (1993). "Chest radiographic findings in patients with acute pulmonary embolism: observations from the PIOPED Study". Radiology. 189 (1): 133–6. doi:10.1148/radiology.189.1.8372182. PMID 8372182. ^ Konstantinides, S; Torbicki, A; Agnelli, G; Danchin, N; Fitzmaurice, D; Galiè, N; Gibbs, JSR; Huisman, M; Humbert, M; Kucher, N (14 November 2014). "2014 ESC Guidelines on the diagnosis and management of acute pulmonary embolism". European Heart Journal. 35 (43): 3033–3069. doi:10.1093/eurheartj/ehu283. PMID 25173341. Archived from the original on 16 November 2016. Pulmonary angiography has for decades remained the ‘gold standard' for the diagnosis or exclusion of PE, but is rarely performed now as less-invasive CT angiography offers similar diagnostic accuracy. ^ a b Brown G, Hogg K (October 2005). "Best evidence topic report. Diagnostic utility of electrocardiogram for diagnosing pulmonary embolism". Emergency Medicine Journal. 22 (10): 729–30. doi:10.1136/emj.2005.029041. PMC 1726554. PMID 16189038. ^ McGinn S, White PD (1935). "Acute cor pulmonale resulting from pulmonary embolism". J Am Med Assoc. 104 (17): 1473–80. doi:10.1001/jama.1935.02760170011004. ^ Rodger M, Makropoulos D, Turek M, Quevillon J, Raymond F, Rasuli P, Wells PS (October 2000). "Diagnostic value of the electrocardiogram in suspected pulmonary embolism". Am. J. Cardiol. 86 (7): 807–9, A10. doi:10.1016/S0002-9149(00)01090-0. PMID 11018210. ^ Amal Mattu; Deepi Goyal; Barrett, Jeffrey W.; Joshua Broder; DeAngelis, Michael; Peter Deblieux; Gus M. Garmel; Richard Harrigan; David Karras; Anita L'Italien; David Manthey (2007). Emergency medicine: avoiding the pitfalls and improving the outcomes. Malden, Mass: Blackwell Pub./BMJ Books. p. 10. ISBN 978-1-4051-4166-6. ^ Shopp, Jacob D.; Stewart, Lauren K.; Emmett, Thomas W.; Kline, Jeffrey A. (2015-10-01). "Findings From 12-lead Electrocardiography That Predict Circulatory Shock From Pulmonary Embolism: Systematic Review and Meta-analysis". Academic Emergency Medicine. 22 (10): 1127–1137. doi:10.1111/acem.12769. ISSN 1553-2712. PMC 5306533. PMID 26394330. ^ Kosuge, Masami; Ebina, Toshiaki; Hibi, Kiyoshi; Tsukahara, Kengo; Iwahashi, Noriaki; Gohbara, Masaomi; Matsuzawa, Yasushi; Okada, Kozo; Morita, Satoshi; Umemura, Satoshi; Kimura, Kazuo (30 October 2012). "Differences in negative T waves among acute coronary syndrome, acute pulmonary embolism, and Takotsubo cardiomyopathy". European Heart Journal - Acute Cardiovascular Care. 1 (4): 349–357. doi:10.1177/2048872612466790. PMC 3760560. PMID 24062927. ^ Kucher N, Goldhaber SZ (2003). "Cardiac biomarkers for risk stratification of patients with acute pulmonary embolism". Circulation. 108 (18): 2191–4. doi:10.1161/01.CIR.0000100687.99687.CE. PMID 14597581. ^ Lankeit M, Jiménez D, Kostrubiec M, Dellas C, Hasenfuss G, Pruszczyk P, Konstantinides S (December 2011). "Predictive value of the high-sensitivity troponin T assay and the simplified Pulmonary Embolism Severity Index in hemodynamically stable patients with acute pulmonary embolism: a prospective validation study". Circulation. 124 (24): 2716–24. doi:10.1161/CIRCULATIONAHA.111.051177. PMID 22082681. ^ McConnell MV, Solomon SD, Rayan ME, Come PC, Goldhaber SZ, Lee RT (1996). "Regional right ventricular dysfunction detected by echocardiography in acute pulmonary embolism". Am. J. Cardiol. 78 (4): 469–73. doi:10.1016/S0002-9149(96)00339-6. PMID 8752195. ^ a b "UOTW #2 Answer - Ultrasound of the Week". Ultrasound of the Week. Archived from the original on 12 January 2017. Retrieved 27 May 2017. ^ National Institute for Health and Clinical Excellence. Clinical guideline 92: Venous thromboembolism: reducing the risk: Reducing the risk of venous thromboembolism (deep vein thrombosis and pulmonary embolism) in patients admitted to hospital. London, January 2010. ^ a b Kearon, Clive; Akl, Elie A.; Ornelas, Joseph; Blaivas, Allen; Jimenez, David; Bounameaux, Henri; Huisman, Menno; King, Christopher S.; Morris, Timothy; Sood, Namita; Stevens, Scott M.; Vintch, Janine R.E. ; Wells, Philip; Woller, Scott C.; Moores, COL Lisa (January 2016). "Antithrombotic Therapy for VTE Disease". Chest. 149 (2): 315–352. doi:10.1016/j.chest.2015.11.026. PMID 26867832. ^ Vinson DR, Zehtabchi S, Yealy DM (November 2012). "Can selected patients with newly diagnosed pulmonary embolism be safely treated without hospitalization? A systematic review". Annals of Emergency Medicine. 60 (5): 651–662.e4. doi:10.1016/j.annemergmed.2012.05.041. PMID 22944455. ^ Yoo, Hugo H. B.; Queluz, Thais H. A. T.; El Dib, Regina (2016-01-12). "Anticoagulant treatment for subsegmental pulmonary embolism". The Cochrane Database of Systematic Reviews (1): CD010222. doi:10.1002/14651858.CD010222.pub3. ISSN 1469-493X. PMID 26756331. ^ Robertson, Lindsay; Jones, Lauren E. (9 Feb 2017). "Fixed dose subcutaneous low molecular weight heparins versus adjusted dose unfractionated heparin for the initial treatment of venous thromboembolism". The Cochrane Database of Systematic Reviews. 2: CD001100. doi:10.1002/14651858.CD001100.pub4. ISSN 1469-493X. PMID 28182249. ^ a b c d e National Institute for Health and Clinical Excellence. Clinical guideline 144: Venous thromboembolic diseases: the management of venous thromboembolic diseases and the role of thrombophilia testing. London, 2012. ^ Benson MD (October 2012). "Pulmonary embolism in pregnancy. Consensus and controversies". Minerva Ginecologica. 64 (5): 387–98. PMID 23018478. ^ Palareti G, Cosmi B, Legnani C, Tosetto A, Brusi C, Iorio A, Pengo V, Ghirarduzzi A, Pattacini C, Testa S, Lensing AW, Tripodi A (2006). "D-dimer testing to determine the duration of anticoagulation therapy". N. Engl. J. Med. 355 (17): 1780–9. doi:10.1056/NEJMoa054444. PMID 17065639. ^ Hirsh J, Guyatt G, Albers GW, Harrington R, Schünemann HJ (June 2008). "Executive summary: American College of Chest Physicians Evidence-Based Clinical Practice Guidelines (8th Edition)". Chest. 133 (6 Suppl): 71S–109S. doi:10.1378/chest.08-0693. PMID 18574259. ^ a b Lavonas, EJ; Drennan, IR; Gabrielli, A; Heffner, AC; Hoyte, CO; Orkin, AM; Sawyer, KN; Donnino, MW (3 November 2015). "Part 10: Special Circumstances of Resuscitation: 2015 American Heart Association Guidelines Update for Cardiopulmonary Resuscitation and Emergency Cardiovascular Care". Circulation. 132 (18 Suppl 2): S501–18. doi:10.1161/cir.0000000000000264. PMID 26472998. ^ Kuo, William T.; Gould, Michael K.; Louie, John D.; Rosenberg, Jarrett K.; Sze, Daniel Y.; Hofmann, Lawrence V. (November 2009). "Catheter-directed Therapy for the Treatment of Massive Pulmonary Embolism: Systematic Review and Meta-analysis of Modern Techniques". Journal of Vascular and Interventional Radiology. 20 (11): 1431–1440. doi:10.1016/j.jvir.2009.08.002. PMID 19875060. ^ Engelberger, R. P.; Kucher, N. (3 February 2014). "Ultrasound-assisted thrombolysis for acute pulmonary embolism: a systematic review". European Heart Journal. 35 (12): 758–764. doi:10.1093/eurheartj/ehu029. PMID 24497337. ^ Hao, Q; Dong, BR; Yue, J; Wu, T; Liu, GJ (30 September 2015). "Thrombolytic therapy for pulmonary embolism". The Cochrane Database of Systematic Reviews (9): CD004437. doi:10.1002/14651858.CD004437.pub4. PMC 1924066. PMID 26419832. ^ a b Nakamura, S; Takano, H; Kubota, Y; Asai, K; Shimizu, W (Jul 2014). "Impact of the efficacy of thrombolytic therapy on the mortality of patients with acute submassive pulmonary embolism: a meta-analysis". Journal of Thrombosis and Haemostasis. 12 (7): 1086–95. doi:10.1111/jth.12608. PMID 24829097. ^ Chatterjee, Saurav; Chakraborty, Anasua; Weinberg, Ido; Kadakia, Mitul; Wilensky, Robert L.; Sardar, Partha; Kumbhani, Dharam J.; Mukherjee, Debabrata; Jaff, Michael R.; Giri, Jay (18 June 2014). "Thrombolysis for Pulmonary Embolism and Risk of All-Cause Mortality, Major Bleeding, and Intracranial Hemorrhage". JAMA. 311 (23): 2414–21. doi:10.1001/jama.2014.5990. PMID 24938564. ^ a b Young, Tim; Tang, Hangwi; Hughes, Rodney (2010-02-17). "Vena caval filters for the prevention of pulmonary embolism" (PDF). Cochrane Database of Systematic Reviews (2): CD006212. doi:10.1002/14651858.cd006212.pub4. PMID 20166079. ^ Augustinos P, Ouriel K (2004). "Invasive approaches to treatment of venous thromboembolism". Circulation. 110 (9 Suppl 1): I27–34. doi:10.1161/01.CIR.0000140900.64198.f4. PMID 15339878. ^ Wood, Kenneth E. (2002). "An approach to Venous Thomboembolism/Pulmonay Embolism in the Critically Ill". In Murray, Michael J.; Coursin, Douglas B.; Pearl, Ronald G.; et al. (eds.). Critical Care Medicine: Perioperative Management: Published Under the Auspices of the American Society of Critical Care Anesthesiologists (ASCCA). Lippincott Williams & Wilkins. p. 536. ISBN 978-0-7817-2968-0. ^ Walker RH, Goodwin J, Jackson JA (17 October 1970). "Resolution of Pulmonary Embolism". British Medical Journal. 4 (5728): 135–9. doi:10.1136/bmj.4.5728.135. PMC 1819885. PMID 5475816. ^ Le Gal G, Righini M, Parent F, van Strijen M, Couturaud F (2006). "Diagnosis and management of subsegmental pulmonary embolism". J Thromb Haemost. 4 (4): 724–31. doi:10.1111/j.1538-7836.2006.01819.x. PMID 16634736. ^ Perrier A, Bounameaux H (2006). "Accuracy or outcome in suspected pulmonary embolism". N Engl J Med. 354 (22): 2383–5. doi:10.1056/NEJMe068076. PMID 16738276. ^ White RH (October 2008). "Risk of fatal pulmonary embolism was 0.49 per 100 person-years after discontinuing anticoagulant therapy for venous thromboembolism". Evid Based Med. 13 (5): 154. doi:10.1136/ebm.13.5.154. PMID 18836122. ^ Barritt DW, Jordan SC (1960). "Anticoagulant drugs in the treatment of pulmonary embolism: a controlled trial". Lancet. 1 (7138): 1309–12. doi:10.1016/S0140-6736(60)92299-6. PMID 13797091. ^ Jiménez D, Yusen RD, Otero R, Uresandi F, Nauffal D, Laserna E, Conget F, Oribe M, Cabezudo MA, Díaz G (2007). "Prognostic models for selecting patients with acute pulmonary embolism for initial outpatient therapy". Chest. 132 (1): 24–30. doi:10.1378/chest.06-2921. PMID 17625081. ^ a b Zhou, Xiao-Yu; Ben, Su-Qin; Chen, Hong-Lin; Ni, Song-Shi (2012). "The prognostic value of pulmonary embolism severity index in acute pulmonary embolism: a meta-analysis". Respiratory Research. 13 (1): 111. doi:10.1186/1465-9921-13-111. ISSN 1465-9921. PMC 3571977. PMID 23210843.